At this time of year, some of the best gifts I receive are those that help me hone my craft. I love writing, and anything that has to do with writing is an awesome gift. One of my new favorites is a writing resource called “The Storyteller’s Thesaurus” which is not your common thesaurus. Now, I’m not saying that normal dictionaries and thesauri are not fun, but this particular thesaurus might just give your muse a good workout. The goal of this book is to give you the ideas, if you look up shrubs you will find scores of shrubby plants to choose from, and instead of your hero creeping through the shrubbery, he may creep through a yew thicket, a laurel thicket, or even a planting of dragon trees. This story is designed to help you string bright ideas together. If you are looking for bushes in a forest, in the same area you will also find trees, wildflowers, weeds, and even fungi that might be spotted. Now, this does not mean that one can use words indiscriminately, a bit of research to see what will flourish in your fantasy growing conditions will be helpful along with this book. Now, this book does not cover insults or swear words, which is a good thing. These terms must be carefully chosen for maximum impact. One of the ideas, for increasing word-count, in NaNo is having one character give increasingly complex and fantastical insults. If one took this road, this book would be very handy. Instead of calling someone a “toad” call them a type of toad, like a “Betic Midwife.” Hmm, is that an insult? Only tone of voice would tell, unless the person knew it was a toad. 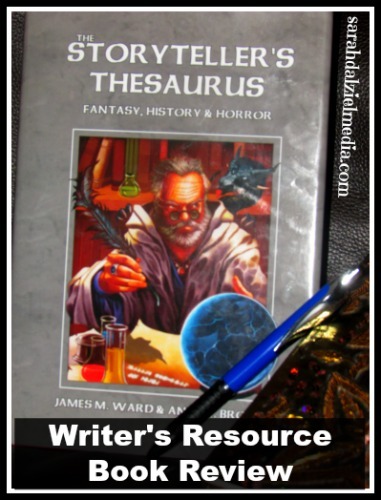 The Storytellers Thesaurus is specifically designed to help with fantasy and horror writing. This includes a specific section on each genre with common dangers, storylines, quests, and dangerous locations. However, I would think that a vampire’s lair was more dangerous in horror than in fantasy, unless it was urban fantasy I suppose. Many of the ideas suggested in these sections would make epic short stories for quick writing practice. I think that this book could be used, successfully, for creative writing practice. Simply put, choose one thing from several categories (say, geology, magic, weapons, and two characters), go to either fantasy or horror and choose, or create, a scenario and start writing. A good length for a short story practice would be 2000-3000 words, so see what your characters do in that time. For the best short-story effect, remember to start in the inciting incident, backstory is nearly unnecessary in short stories. I would highly recommend this book for fantasy writers, particularly if you are working in historical or historical-ish times. There is a pile and a half of clothing, profession, and other suggestions that can help pull a fantasy world from “same old” to “oooh” in short order. Of course, designing worlds is only about a quarter of a fantasy writer’s challenge, good plot and characters are also in there, as well as good writing (or moderately good writing and a good editor). What books do you include as essential on your writer’s bookshelf? Are they dictionaries, thesauri, style guides, or what? Leave a comment, I greatly enjoy hearing from you!